Rio Tinto (LON, ASX, NYSE: RIO) has started showing its rare Argyle pink diamonds at London’s Kensington Palace in a collection that features more than $60 million in jewellery made with the coloured gems. The exhibition, entitled “Out of the Vault: Pink Diamonds and Royalty,” unveils the tales of the Argyle pink diamonds and their experiences with the royal families, sultans, maharajas and other colourful clientele. The inspiration for the pink diamond jewellery exhibition came from Queen Elizabeth II Diamond Jubilee. She had a solitaire pink diamond, gifted to her (The Williamson Pink) and set in the centre of a flower-spray brooch created by Cartier, in the year of her coronation. Throughout history kings, emperors, princes and potentates have treasured pink diamonds for its nobility, rarity and sheer beauty. Pink diamond production, however, had always been sporadic. It wasn’t until the discovery of the Argyle Diamond Mine in 1979, that there was a regular —though very limited— supply of these kinds of gems. Jewellery historian, Vivienne Becker, notes that over the past 25 years the diamond industry has come to appreciate the beauty of the Argyle pink diamond and its place in the story of jewellery. “The Argyle pink diamond has become today’s ultimate possession, an incomparable object of desire that has captured the imagination of connoisseurs and collectors around the globe,” Becker said in Rio’s press release. The 40 rare and valuable items of pink diamond jewellery on display at Kensington Palace are sourced from luxury jewellers and designers from the US, Australia, Japan, China, India and Europe. 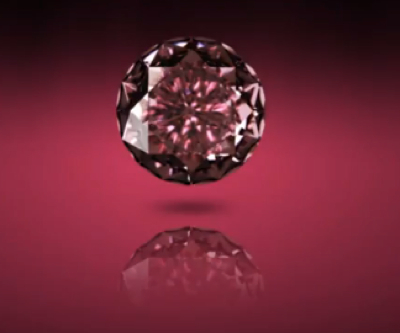 Image of an Argyle Pink diamond from YouTube.